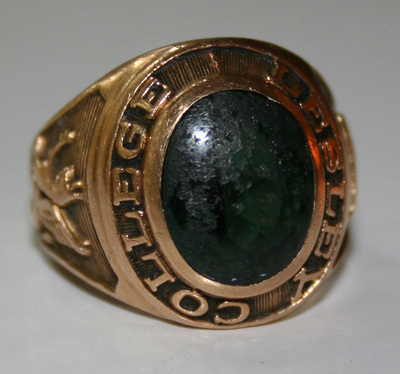 Photograph of 1948 class ring belonging to Selma Chervin Bell, '48. "Lesley College is engraved around the peridot gemstone. Peridot was chosen because the color tone matches Lesley College's school color. On the left side of the ring, a griffin is engraved and on the right, a family shield - both taken from Lesley College's logo. Edith Lesley Wolfard adopted Lord Leslie Newark of Scotland's coat of arms and family shield for Lesley in 1930. Bell did not donate the actual ring, only digital photographs of the ring are in the Lesley University Archives.